It is hard to look manly prancing through a meadow, net in hand, chasing a butterfly as I did as a student at Morehead State University. Don’t think this was a daily occurrence, as it only happened once when we were trying to collect specimens for our insect collections in Invertebrate Zoology class. 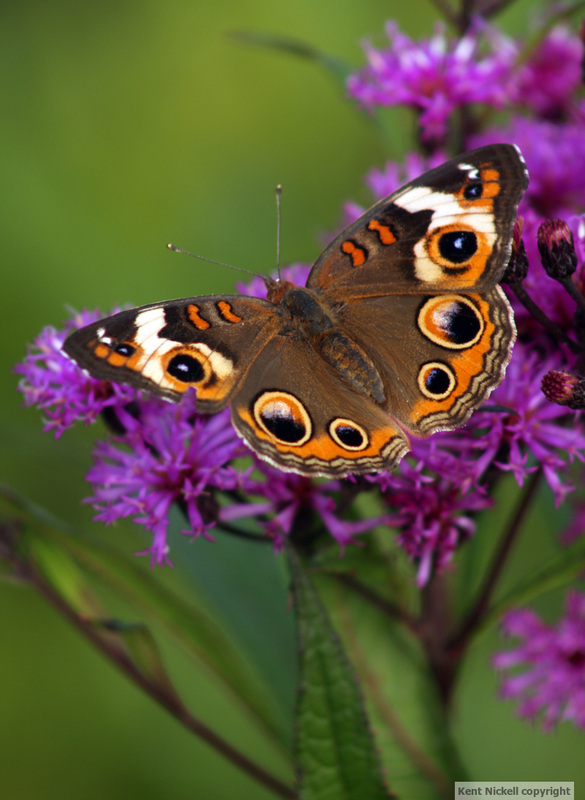 I was reminded of this two summers ago when I was chasing this common buckeye butterfly through a field of ironweed in a beautiful area of Morgan County, Kentucky called Woodsbend. Except it was less prancing and more hobbling. Carrying a camera instead of a net was probably not any more manly looking either. The order of butterflies and moths is called lepidoptera. This is the only order I remember from that class and only because our professor told us that butterflies burst out of their cocoons and “lepid” up off the ground. Apparently there is an advantage to having a PhD. This particular butterfly must have sucked down the nectar from a flower that was doused with the fifth can of Red Bull some teen-ager could not finish due to his sudden tachycardia. I chased it for thirty minutes before it lit on this ironweed plant. In this part of eastern Kentucky, fields of ironweed indicate that summer is about over and fall is coming. Ironweed plants are difficult to photograph. The true color is hard to capture. It takes a dimmer overcast day to capture the true deep purple of the blooms. Photographing butterflies, on the other hand, just takes someone who is in denial about their ability to maneuver strappingly through a meadow. My wife loves daisies. It’s her favorite flower. Therefore it is my favorite flower. If something can bring a smile to my wife’s face in exchange for the perpetual eye roll response to my usual way of doing things, then I want a case, or a gross, or a truckload, or a hillside of these little glee-makers. I guess you would assume this blog is an act of contrition to something stupid I said…or did…or acted upon…or any other poorly thought-out instinct that I am responsible for in the time-space continuum, and that would be a good assumption. I have used the Bellis perennis on many of the above occasions. However, this is not one of those many instances. I took this photo of a daisy in my father’s flower garden. I used a Canon 50 mm macro lens. I wanted the contrast of the white petals with the darker shaded background. 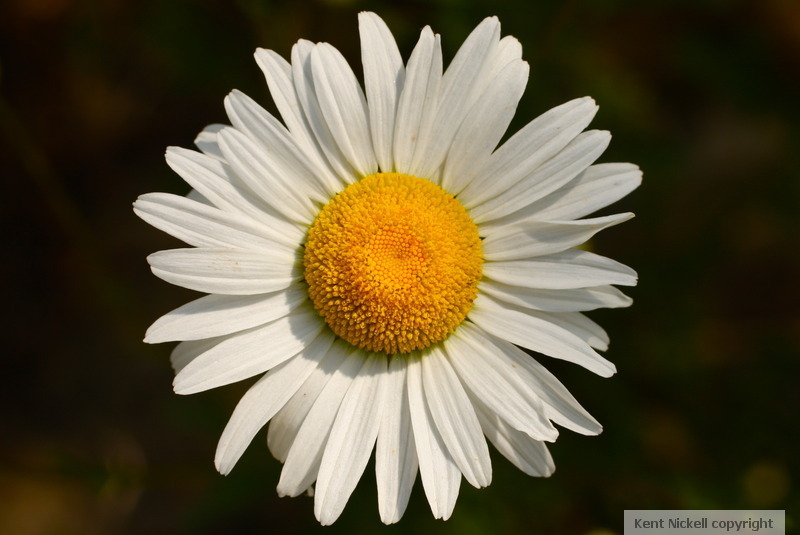 Whenever I see daisies, I first think of my wife. After many hours of thinking precious thoughts about my wife, I think of Meg Ryan in “You’ve Got Mail”. I hate to admit I love this movie. I will always watch it whenever I am riding the Big Kahuna of the Fiber-optic Sea (channel-surfing). No matter what point I pick up the movie, I will always watch it to the end. I love when Joe Fox comes to visit Kathleen Kelly when she is sick. I love it when she says, “I have a temPAtour”. And I love when Joe gives her daisies and she says ” they are the friendliest flower”. In some discombobulated way, this blog is about my brother-in-law. He loves the movie “Tombstone”, a little more testosterone-driven than Meg Ryan and Tom Hanks. He can quote all of Doc Holliday’s musings, as in “…you’re a daisy if you do”. My brother-in-law retired last week after forty years of educating. He was very good at whatever job he had in education from teacher, to coach, to principal, to director of pupil personnel. He was very good because his first concern was the students. He will never know the full scope of what he meant to those many students that were taught and guided by him and even those that were disciplined by him. My brother-in-law was never accused of being politically correct. He had been known on occasion to tell one or more of his female co-workers to visit the moon hut during a certain monthly celebration. (I hope this doesn’t interfere with his first retirement check). But, to a woman, they all loved him. He was, at times, at odds with the teachers union, his superiors, and parents. But in each instance, he had the best interest of the students in mind. He was very well respected and like Frank Sinatra, he did it his way. So to my brother-in -law, I say “well done”. Your retirement is well-deserved and you will be missed by your peers and co-workers and above all, the students. So here’s to more Florida time in winter with your lovely wife, more golf, more late morning breakfasts, more days with your grandkids and more times to watch “Tombstone”. Incidentally, if my brother-in-law finds out I can quote “You’ve Got Mail” like he can quote “Tombstone”, he will want to send me to the moon hut the next time he hears me fussing. If you like this photo, you can see more of my photos here. Don’t you just love when little pleasures suddenly invade your dull, dreary routine. I am not saying that we all live dull, dreary, mundane lives and I don’t think of my life as that way either. However none of us are exempt from these feelings from time to time. In fact some of us find comfort in routine. After the tornado went through West Liberty and Morgan County about a year ago, most of us prayed for the return of routineness in our lives. I am talking about that instant, when in the course of our slogging through the day-to-day, something happens that stops us from turning the little wheel or ringing the bell for the pellet. A shifting breeze brings a wonderful scent. You try to identify this heavenly aroma. Is it a blossom, a flower, a scent, a shampoo? It makes you pause for a short time and just breathe it in…then it’s gone and you return to the task at hand. A cloud forms with a shape that causes you to sit and watch for a few minutes and wonder if this is a “sign from above.” A song from a robin or wren or mockingbird, barely audible above the noise of your day, catches your attention and you wonder where she is perched and as you look for her, it makes you concentrate on the beautiful melody and forget, for a moment, the pressure you feel. This picture represents one of those unexpected vignettes of bliss that occur in our lives. One recent morning, while at my computer and not feeling very inspired or intelligent or remarkable or special, I was just beginning the day before going to work. I saw something in my periphery that was unusual. 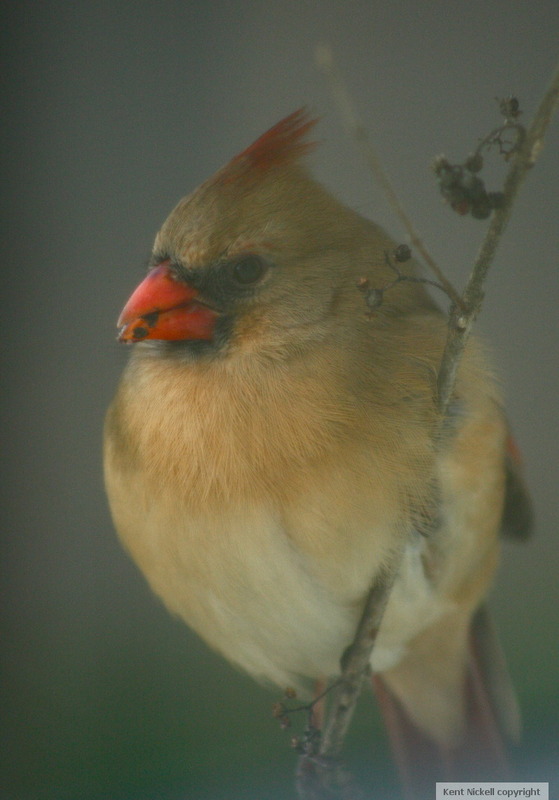 A female cardinal lit on a beauty berry plant outside my window. I have never seen a bird on this plant that is only a few feet from my desk. I stopped and watched her munch on the berries, transfixed on the beauty and simplicity of this moment. I slowly reached for my camera, trying not to startle her, and to my amazement she stayed right there. The above photo captures this moment. I must say it made the rest of the day so much more enjoyable. Of course, there are, for those pessimists, those moments that happen unexpectedly that gives you reason to wonder if anything can go right. Say, for example, like the time you enter the sanctuary before the morning church service. You parade down the aisle, smiling, waving like the Rose Bowl queen, to those on your right and on your left. You shake hands like anyone who has ever run for public office. After this production of your grand entrance, you settle in your seat, so pleased with your performance. You smile at your adoring wife, as she rolls her eyes. You happen to glance down… your fly is wide open. While your wife is heaving in uncontrolled laughter, you know she has just experienced one of those little pleasures.